Welcome Aboard the Museum Vessels! 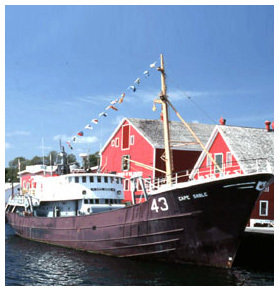 The Fisheries Museum of the Atlantic has a small fleet of vessels. Several are located at wharf-side and the two largest vessels, Theresa E. Connor and Cape Sable, are available for visitors to go aboard. While there, you can enjoy yarns with the Old Salts who are part of the Museum staff. The flagship of the Fisheries Museum of the Atlantic, Theresa E. Connor is Canada’s oldest saltbank schooner. 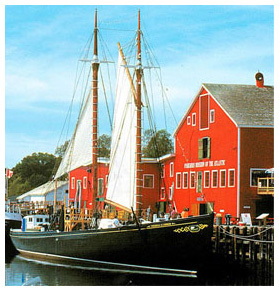 Built in 1938 in Lunenburg, at the Smith and Rhuland Shipyard made famous as the birthplace of the original Bluenose, the vessel fished as a dory schooner for 25 years. During that time the crew used double (two-man) dories and fished with long trawl lines of baited hooks. In the spring of 1963, Captain Harry Oxner attempted to take Theresa E. Connor on one last dory trip to the Banks. With a small crew, they sailed from Lunenburg to Newfoundland, but they were unable to find a sufficient number of men to make the trip. Technology had changed from hook and line to trawlers with huge nets. Fishermen were no longer willing to risk life and limb aboard dories. Theresa E. Connor slipped quietly back into port, the last of the once great fleet of Lunenburg salt bankers. Visitors can go above and below deck, enjoying the look and feel of an authentic Grand Bank schooner. Retired fishermen and captains work as Heritage Interpreters aboard the vessel and area always pleased to have a chat about their fishing experiences. Demonstrations of fishing-related skills are performed on a regular basis. Cape Sable is a steel-hulled side trawler, built in 1962 at the Boot-Leiden Shipyard, Leiden, Holland. The trawler is the style of vessel that eventually replaced dory schooners like the Museum’s Theresa E. Connor. Cape Sable fished for National Sea Products Limited for twenty years and retired in 1982, having been replaced by larger stern trawlers. Unlike fishing schooners, which could be away from home for a month or more at a time, an average trip aboard Cape Sable lasted eight to twelve days. Total fishing capacity in the hold was 300,000 pounds of fish. Retired fishermen and captains are Heritage Interpreters aboard Cape Sable, sharing stories and experiences with visitors. Demonstrations of net-mending are performed on a regular basis. At the end of one of the Museum’s finger wharves, facing the harbour, are the wheelhouse and Captain’s cabin of the side trawler Cape North, build in 1945. This vessel had been the first successful fresh fish trawler to fish from the port of Lunenburg. 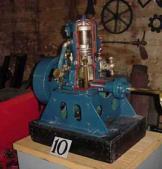 Make-and-break engines were a fabulous change in technology at the turn of the 20th century. Small inshore fishing boats were suddenly able to travel, whether or not there was wind to fill their sails. The distinctive putt-putt-putt of the make-and-breaks echoed along the coast as coastal dwellers achieved an unheard-of level of independence!